I've been following the fortunes of 4711 cologne for some time now. It has a wonderful heritage, a distinctive brand image - with the baroque gold and Bremen blue labelling - and it's a terrific light cologne. It's a refreshing tonic in the summer. You can soak a handkerchief in the stuff and give yourself a discreet rub-down when you're wilting in the heat or drained by a particularly vexing crossword. But go into one of the high street chemists and there the famous Molanus bottles sit in 'granny corner' overlooked and tucked away, whilst those dreadful and muscular celebuscents with the big marketing machinery behind them jostle for attention in the prime positions. A disgrace, I'm sure you'll agree. I placed 4711 cologne in the category of neglected classic and expected one day to see the position it took on the shelves to be empty, replaced with a scent 'by' a runner-up from the X Factor. Civilisation goes down a notch further and another great name is consigned to history. But this tale has a happy ending, chums. The owners are determined to keep this grand name alive and the original 4711 is staging a reassuringly dignified and understated comeback. And it's getting its well-earned due as an undisputed classic. Starting here. Cologne originates from the fine German city of the same name. 4711 was launched in the city by Willhelm Muelhens in 1792. Muelhens was one the local pioneers who capitalised on the popularity of a scent made famous by Cologne inhabitant and perfumer Giovanni Maria Farina in 1709. 4711 takes its name from Glockengasse 4711, the building that housed the original manufactory. The brand is currently owned by German scent manufacturer Mäurer & Wirtz, a fifth-generation family firm. The scent of a traditional eau de cologne is based on a combination of citrus oils. 4711 is composed of bergamot, lemon and orange, with lavender, rosemary and neroli. It's astringent, clean and fresh. 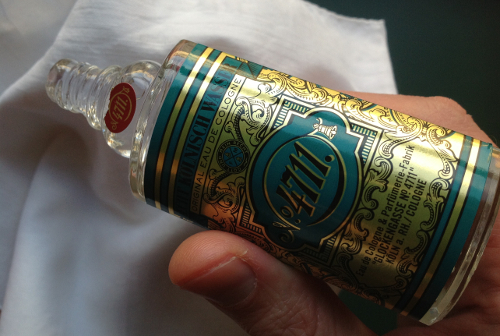 The famous bottle of 4711 was designed by distiller Peter Molanus, and is worth the entrance fee alone. Designed in 1820, the hexagon shape is intended for easier handling and transportation. The collar piece, or 'crop', between the shoulders and cap allows the liquid to expand in high temperatures. The Bremen blue of the label is unique to 4711. The Molanus botlle is also used on the youthful and fruitier younger sister of the original, 4711 Nouveau de Cologne, which was introduced in 2011. Here's a film depicting the heritage you find in every bottle of 4711.